Rugs.shop brings your new rug right to your doorstep. From gleaming hardwood and lasting laminates, to innovative luxury vinyl and trusty tile, hard surface flooring has so much to offer to your home or business. 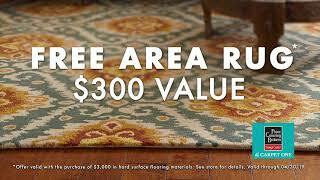 Receive a FREE area rug with a hard surface purchase of $3,000 or more. Stop in today to learn more! We are proud to have been your family-owned, neighborhood flooring experts since 1986. Owner Dennis Lauterbach has made it his priority to provide customers with a positive, memorable experience when purchasing flooring and it has been our pleasure to serve the flooring needs of the Traverse City area. Drop by and let us help you choose the perfect flooring for your home and lifestyle. Be sure to check us out on Facebook to see everything that's happening at our store. We proudly offer Hunter Douglas shades, blinds, sheers, shutters and more. You can have the ultimate light and privacy control with window treatments. We can help you with your commercial flooring project.